Currently The London Film Museum are hosting the rather spectacular Ray Harryhausen - Myths & Legends exhibition. Well worth popping in to visit if you haven't already. Earlier this year to celebrate Mr Harryhausen's 90th Birthday and the launch of the exhibition he gave various sold out talks in London. If you didn't get the chance to hear the living legend talk in person - The London Film Museum have made the next best thing possible. 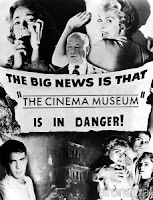 The London Film Museum spoke exclusively to Mr Harryhausen about his filmmaking career and the Myths & Legends exhibition. The interview was conducted by his old friend Leslie Hardcastle, member of the London Film Museum Advisory Committee.